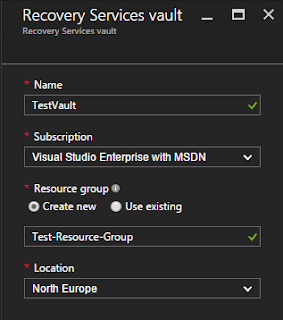 There are 4 distinct offerings as part of Azure Recovery Services. 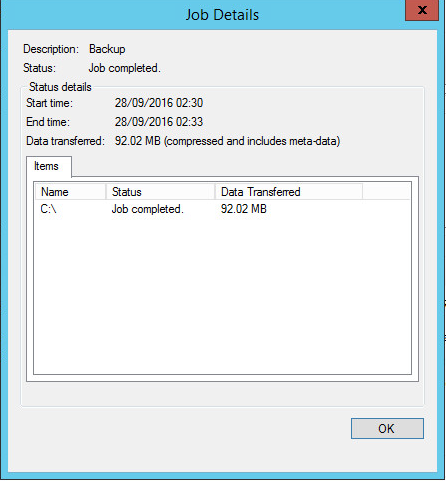 This post will cover the basic file and folder backup offering for Windows machines. Parts 2 and 3 will cover more advanced backup scenarios and site fail over. The file and folder backup agent is quite limited in scope and does not protect system state or any live application data such as SQL Server, Hyper-V, SharePoint or Exchange. 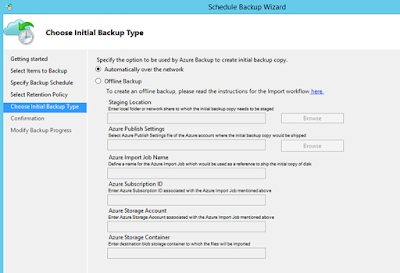 This offering is simply to backup a few files on a system in much the same way as DropBox or OneDrive folder sync does. It seems that this product is suited to desktops and laptops that house user data and need the data backed up on a daily basis. The backup agent requires internet access but this can be configured via a proxy server. 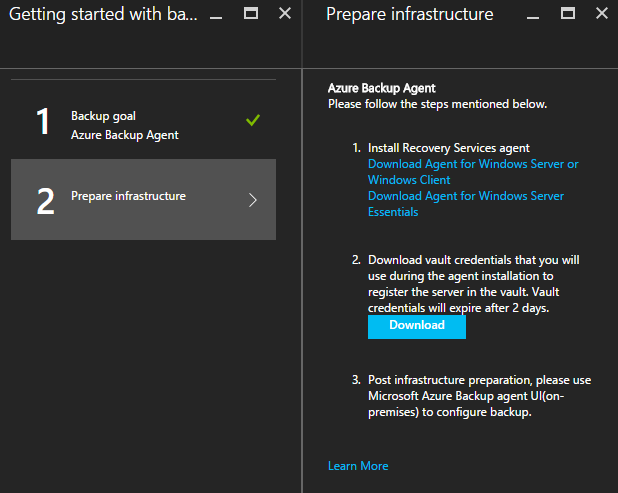 Once created, open the resource and browse through to "Getting Started," > "Backup." 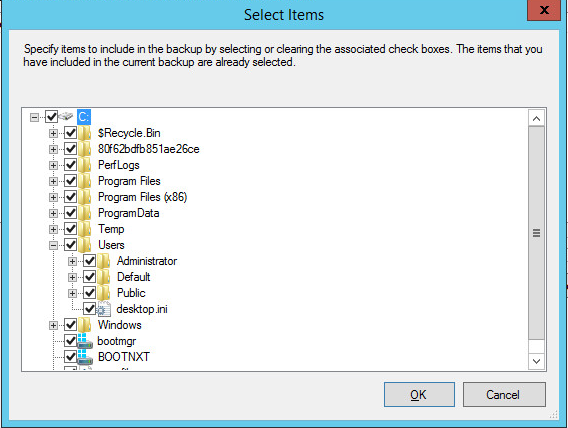 Select Files and Folders and click OK. 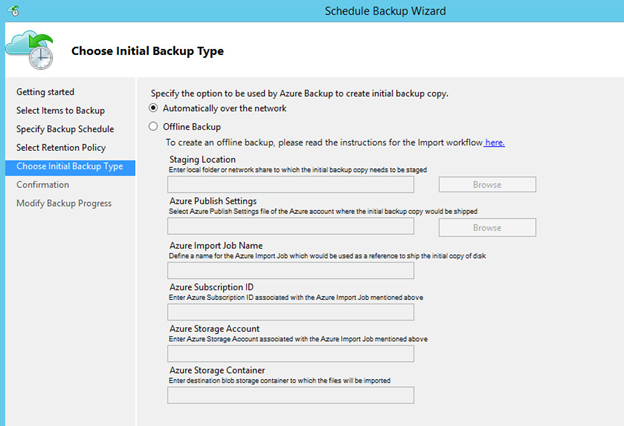 Note if you select any other option it will suggest downloading Azure Backup Server which is a cut down version of System Center Data Protection Manager. 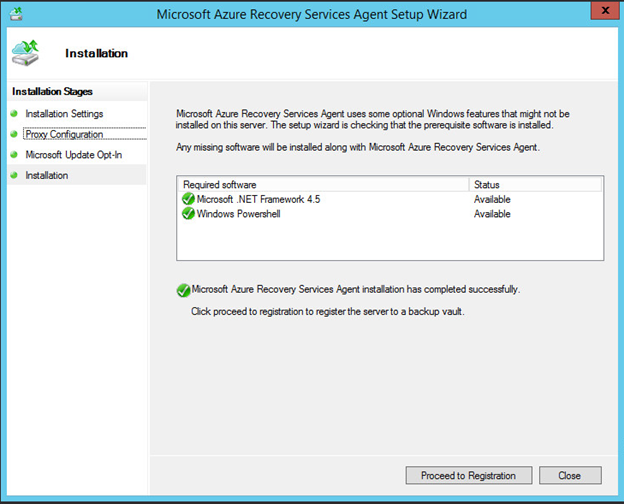 The wizard now shows to download the Recovery Services Agent and Vault Credentials to configure the backup. 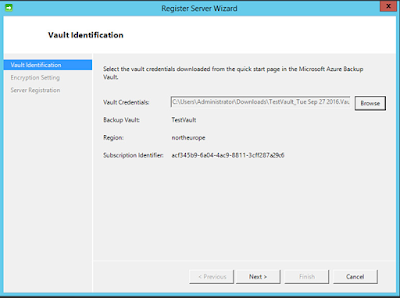 Download both the relevant client and credential file and complete the installation wizard on your machine. 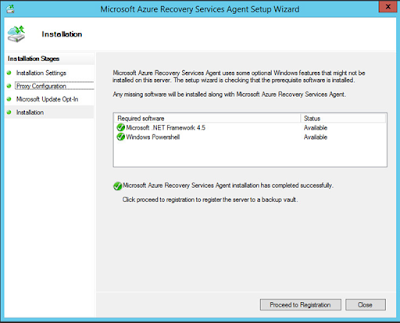 The installation is a simple 5 screen wizard which automatically installs the prerequisites. On the encryption page, select a folder to save your encryption phrase, generate a new phrase or enter one. 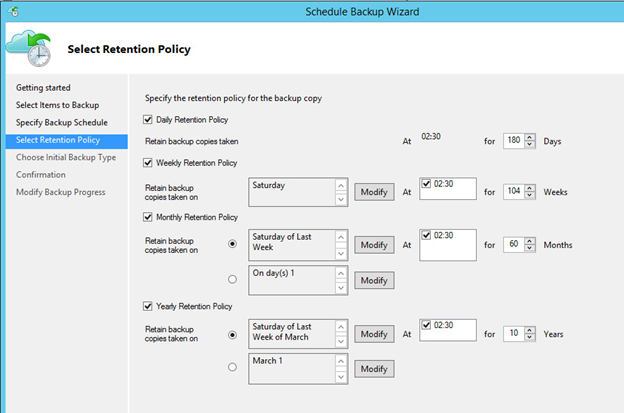 The backup schedule allows between 3 backups per day and 1 every 4 weeks. A warning is shown that the volume size limit for backups is 54400 GB which seems way larger than would be expected for this type of backup client. Initial backup took 38 Minutes to complete the initial seed over a 100 Mbps connection. This works out at around 3.5 MB/sec (28 Mbps) or 12.6 GB/Hr. backup speed. I copied over a 1 GB ISO file and ran a second backup. Backup Log location can be found in the portal. Unfortunately when I checked on the server the log was not in the file system. Restores can be done by launching the wizard from the right hand pane. 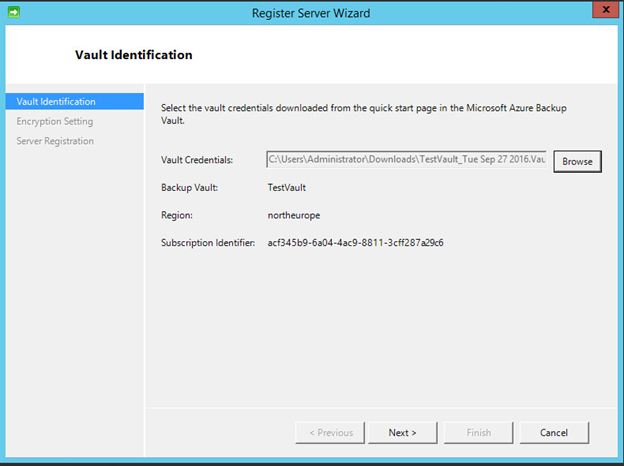 You can choose to recover from this server or another server using a vault credential file. You can browse or search for files. Browsing allows you to select the date and file for recovery. 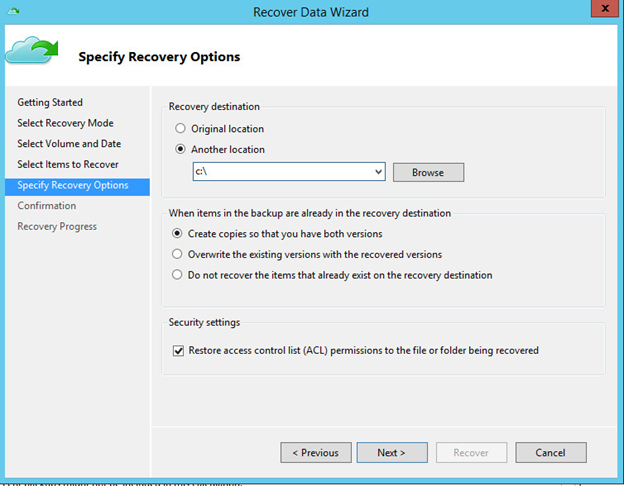 Recovery supports restoring ACLs of original files and has overwrite options. 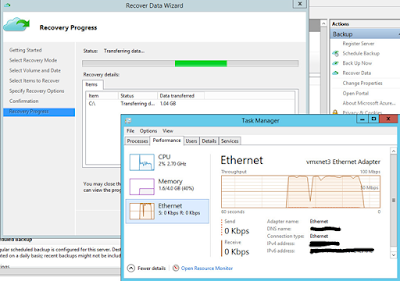 Recovery of a 1 GB ISO file took just 3 mins on a 100 Mbps connection. The restore actually saturated the 100 Mbps connection. Storage transaction costs are not charged, you pay a base cost for the machine and then per GB. 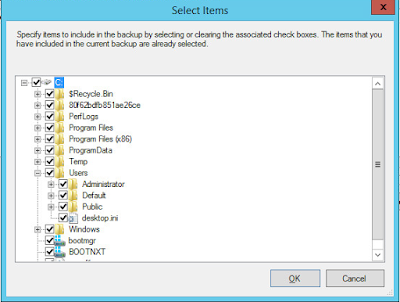 True backup and not file sync – Human error can lead to file deletion on normal file sync services. Crypto lockers could possibly affect files on file sync services if versioning is not set up correctly. 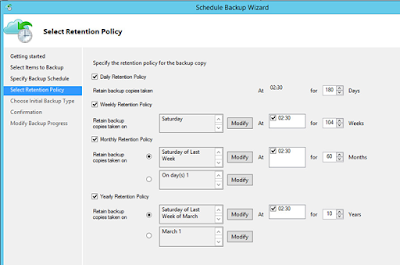 Final Thought – Unless you need the customisable retention for compliance or you need to backup your data to multiple locations. 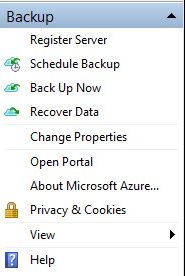 The simplicity and cost of the OneDrive and DropBox standard offerings seem like the obvious choice for simple file and folder backups. You should be careful to read these services options for deleted file retention and file versioning to protect against deletion, crypto-lockers or corruption.